During the mid-1800s, the inn saw a healthy dose of passersby, which encouraged Yankee Bill to increase the size of the inn “from one to seven cabins”. Native Americans who lived in the Gun Lake area would supply the inn with fresh meat that they hunted from the land and the water, and men were hired to garden fresh produce. Other items would have to be bought or traded for in Kalamazoo or Grand Rapids, both a long day’s travel from the inn. The popularity of the inn was due to its location along buggy trails, however business declined once railroads were built and traffic through the area slowed down substantially. 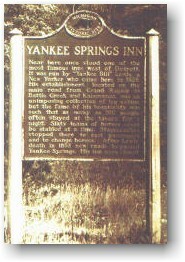 The Yankee Springs Inn is no longer standing, but the site is along the North Country Scenic Trail just south of the Yankee Springs State Park, a popular tourist destination in the summer.